Tribrachidium heraldicum was an immobile benthic (lived on the seafloor) organism. It had tri-radial symmetry, with three arms that appear to uniformly spiral outwards from its centre. The fossil can be found in isolation, or in large groups on single beds (Hall et al., 2015). ​Recently, Rahman et al., (2015) applied computational fluid dynamics to a virtual 3D model of a Tribrachidium specimen, and found reasonable evidence to suggest that the organism passively fed on particulate matter suspended in the water column. 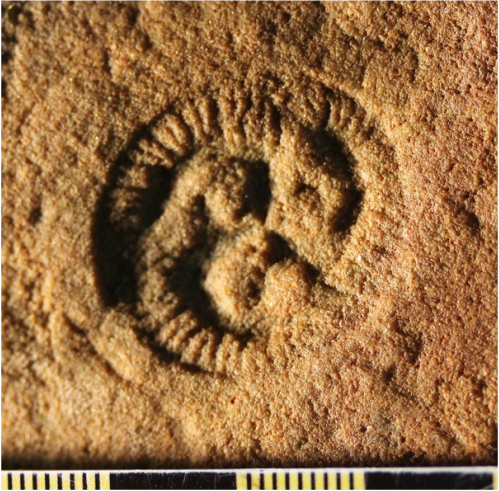 Impressions of Tribrachidium specimens in the fossil seafloor appear to spiral anticlockwise, however the original organism would have spiralled in a clockwise direction. Disc-shaped fossils, slightly biconvex, with a steeply sloping margin; up to about 4 cm in diameter. The diameter of the smallest specimen on which the edge of the disc can be seen, is 9 mm. The oral side has three raised brachia radiating from the centre and curving in a clock-wise direction to become parallel to the periphery, and tapering to their extremities. The curve is more evenly rounded in small specimens and more angular in large ones. A small, central Y-shaped groove which may represent the mouth is seen very rarely between the arms. Dome-shaped 'bullae' (Glaessner 1959b) occupy part of each interbrachial spcae, each being attached to the neighbouring convexly curved side of the arm. The arms (brachia) and bullae are elevated above the oral surface and have resisted flattening to some extent. The distal two-thirds of each arm bears short stout tentacles on the outer side and tip. The number of tentacles is generally greater in larger specimens, and some appear to be arranged in alternating series. Fine, long, straight or gently curved bristles, all equal in width, extend from the crest and the concave curve of each arm towards the periphery and can also be seen extending from the surface of interbrachial space past the tip of an adjoining arm. They are not preserved in all specimens. ​Only a few, shallow, concentric grooves occur on the aboral side. A wide marginal zone shows in composite moulds; though subject to some flattening, it does not transmit structures of the oral side, which suggests considerable resilience.